To submit a new article for review, you are required to register into our peer-review system as an author. If you have never submitted an article to Medical Paradigm before, please review the Author Submission Guidelines first. Letters to the editor — Comments on papers published in Medical Paradigm or on other matters of interest (submit to [email protected]). Letters should not exceed 2 pages in length (including literature citations). Publication is solely at the discretion of the editor, who occasionally asks experts about the merit of the letter content. Integrative medicine literature — In-depth literature searches of English bibliographies on topics related to integrative medicine. Book reviews — As solicited by the editorial office. Announcements of forthcoming meetings — Notice of forthcoming meetings, course offerings, and other events relevant to integrative medicine. In some instances, a telephone call may be more convenient than a letter for dealing with specific questions. Thetelephone number of the editorial office is +1-609-652-6750 (U.S.A.) or +31-20-776-0565 (Netherlands). Authors are invited to submit the names and addresses of five or six individuals who could, in the authors’ opinion, expertly review the manuscript. However, the editors reserve the right to choose all reviewers. All original articles submitted for publication will be refereed by at least three experts in the field. 1. Conceived and planned the work that led to the paper. 2. Wrote the paper or reviewed successive versions and took part in the revision process. Holding a position of administrative leadership, contributing patients, or collecting and assembling data, are not, by themselves, authorship criteria. Other persons who have made substantial, direct contributions to the work, but who cannot be considered authors should be acknowledged with their permission. In a cover letter, authors must disclose any financial interests—direct or indirect—that might affect the conduct or reporting of the submitted work. Sources of outside support for the research—including funding, equipment, and drugs—must be named in the cover letter. The role or roles of the funding organization, if any, in the collection of data, in data analysis and interpretation, and in the right to approve or disapprovepublication of the finished manuscript must be described in the Methods section of the text. The cover letter must give full details of any possible previous or duplicate publication of any content of the paper. Previous publication of a small fraction of the content of a paper does not necessarily preclude that paper being published, but the Editors need information about previous publication when deciding how to use space in the Journal efficiently. Failure by authors to fully disclose possible prior publication will be regarded as a breach of scientific ethics. Please send a copy of any document that might be considered a prior publication. When appropriate, authors should state in the Methods section the procedure used to ensure adherence to ethical guidelines on informed consent. They should also should affirm that such consent was obtained. Moreover, the statement should confirm review of the study by the appropriate institutional review board, or affirm that the protocol is consistent with the principles of the Declaration of Helsinki as amended in Tokyo (1975), Venice (1983), and Hong Kong (1989) (1). All authors of papers accepted for publication are required to sign a form affirming that they have met the criteria for authorship, have agreed to be authors, and are aware of the terms of publication. Full-length papers should be typed double-spaced, in English, and contain an abstract that briefly summarizes the essentialcontents (see below). Every effort should be made to avoid jargon, to spell out all nonstandard abbreviations the first time they are mentioned, and to present the contents of the study as clearly and concisely as possible. the name, address, fax, and telephone number of the author to whom correspondence should be sent. copies of any published reports that may duplicate material in the submitted manuscript. written permission of authors and publishers to use any previously published material (figures, tables, or quotations of more than 100 words). Authors should retain an additional copy of their manuscript and figures for their own files. A copyright transfer must be signed and dated by all authors and returned to the Editor. Letters to the editor: Letters dealing with published articles or matters of interest to researchers are invited. Letters should be short (no more than 2 pages, key references included). The letter must typed double-spaced and must include references where appropriate. Where a published article is involved, the authors of the original publication will be invited to submit a response. Book reviews: Authors are invited to submit suggestions for book reviews to the Editorial office. Announcements and calendar: The Editor welcomes notices of meetings, conferences, and other events of interest to the integrative medicine community. All such items will be listed at no charge in each issue of the Journal and will be regularly updated. Nomenclature and abbreviations: Where possible, nomenclature and abbreviations should accord with internationally agreed rules. The top margin on the title page shouldbe 5 cm deep, all other margins should be 2.5 cm. Use double spacing throughoutthe manuscript, including references and figure legends. Organize the manuscriptin the order indicated below. Each component should begin on a separatepage. A running title and page number should appear in the upper right-handcorner of each page. the title of the article (80 characters maximum). the authors’ full names [first name, middleinitial(s), and surname]. the authors’ affiliations [name of department(if any), institution, city, and state or country where the work was done],indicating which authors are associated with which affiliations. acknowledgements of grant support and of individualswho provided direct help in the preparation of the paper. the name, address, e-mail address, and facsimileand telephone numbers of the corresponding author and, if different, theauthor to whom reprint requests are to be sent. a running title (not more than 30 characters). Page 2 should contain the title of thearticle, followed by an abstract in a structured form according to theformat proposed by Haynes and colleagues (Ann Intern Med 1990; 113:69–76).Following the abstract, a list of up to eight key words or phrases shouldbe provided for indexing. Text: All manuscripts should be typedon one side of the paper, double-spaced. Abbreviations and symbols: Do not useabbreviations unless absolutely necessary. Do not abbreviate the namesof symptoms or diseases (myocardial infarction, not MI), or of anatomicor histologic characteristics (left ventricular, not LV). Do not explainabbreviations for units of measurement [3 mL, not 3 milliliters (mL)] orstandard scientific symbols [Na, not sodium (Na)]. Do abbreviate long names of chemical substancesand terms for therapeutic combinations, such as MOPP. Do abbreviate namesof tests and procedures that are better known by their abbreviations thanby their full names (VDRL test, SMA-12). Do abbreviate units of measurementwhen they appear with numerals (measured in milliliters, but 10 mL). Useabbreviations in figures and tables to save space. Explain all such abbreviationsin the figure legend or table footnote. Units of measurement: Use SI units throughout.When units other than SI units are widely used, they can be indicated inparentheses after the SI unit. The editorial office will provide conversioninformation with the article when appropriate. Generic names must be used for all drugs.Include the proprietary name if it is more commonly known than the genericname; if it is necessary to differentiate among drug forms; or if a specifictrade preparation was used in a study or involved in an adverse effect.Instruments may be called by their proprietary names; the name and locationof the manufacturer must be given in parentheses in the text. Short communications should be organizedin this format: Introduction, Materials and Methods (or Experimental Procedures),Results, Discussion, Acknowledgments, Abbreviations, References. Authorsmay insert a short summary or Conclusion section following the Discussionsection if they wish. In some cases, at the author’s discretion, Resultsand Discussion sections may more appropriately be combined than separated.Other descriptive headings and subheadings may be used if appropriate. Short communications should be no longerthan 6 double-spaced typewritten pages including figures, tables, and keyreferences. Short communications do not require an abstract. Review articles should be organized inthis format: Outline (using main and second-order section headings), Introduction,Text, Conclusions or Summary, Acknowledgments (optional), Appendices (optional),List of Abbreviations, References. Number references in the order in which theyare first cited in the text. Cite references using Arabic numerals in parentheses. Use the reference style of the National Libraryof Medicine, including their standard abbreviations for journal titles. Include an “available from” note for documentsthat may not be readily accessible. Cite symposium papers only from publishedproceedings. When citing an article or book accepted forpublication but not yet published, include the title of the journal (orname of the publisher) and the year of expected publication. Include citations of unpublished material[for example, papers presented orally at a meeting or unpublished work(personal communications, papers in preparation)] in the text, not in thereferences. Submit a letter of permission from the person being cited authorizingthe citation of such communications. Use ibid. or op cit. The sample references shown below arebased on the style specified by the Uniform Requirements agreement. Journals: List all authors when six orfewer; when seven or more, list only the first six and add et al. Vega KJ, Pina I, Krevsky B. Heart transplantationis associated with an increased risk for pancreatobiliary disease. AnnIntern Med 1996; 124:980–3. The Cardiac Society of Australia and NewZealand. Clinical exercise stress testing. Safety and performance guidelines.Med J Aust 1996; 164:282–4. Shen HM, Zhang QF. Risk assessment ofnickel carcinogenicity and occupational lung cancer. Environ Health Perspect1994; 102(Suppl 1):275–82. Enzensberger W, Fischer PA. Metronomein Parkinson’s disease [Letter]. Lancet 1996; 347:1337. List all authors or editors when six orfewer; when seven or more, list only the first six and add et al. Ringsven MK, Bond D. Gerontology and LeadershipSkills for Nurses. 2d ed. Albany, NY: Delmar; 1996. Norman IJ, Redfern SJ, eds. Mental HealthCare for Elderly People. New York: Churchill Livingstone; 1996. Phillips SJ, Whisnant JP. Hypertensionand stroke. In: Laragh JH, Brenner BM, eds. Hypertension: Pathophysiology,Diagnosis, and Management. 2d ed. New York: Raven; 1995: 465–78. Bengtsson S, Solheim BG. Enforcement ofdata protection, privacy and security in medical informatics. In: Lun KC,Degoulet P, Piemme TE, Rienhoff O, eds. MEDINFO 92. Proceedings of the7th World Congress on Medical Informatics; 6–10 September 1992; Geneva,Switzerland. Amsterdam: North-Holland; 1992: 1561–5. Use the forms shown below for citationsnot included in the preceding examples. Leshner AI. Molecular mechanisms of cocaineaddiction. N Engl J Med 1996; [In press]. Roberts JL. Villain or victim? Newsweek1996; 4 Nov:40–1. Citations of material not available froma print source should be cited within the text (placed within parentheses). Keep each table to a reasonable size;very large tables packed with data simply confuse the reader. Each tableand every column should be provided with an explanatory heading, with unitsof measure clearly indicated. The same data should not be reproduced bothin a table and in a figure. Footnotes to a table should be indicated bysuperscript lowercase letters. Tables and illustrations (together withtheir footnotes or captions) should be completely intelligible withoutreference to the text. Original (not photographed) copies should be submitted. Illustrations for reproduction shouldnormally be about twice the required size. Figures should be professionallydrawn or photographed. Photographs of tissues, cells, or subcellular componentsshould be included only when essential. Legends should be typed double-spacedand numbered with Arabic numerals that correspond to the illustrations.Legends are to be submitted on a separate page. When symbols, arrows, numbers, or lettersare used to identify parts of an illustration, each symbol should be clearlyexplained in the legend. Legends should permit the figures to be understoodwithout reference to the text. If the figure has been previously published,a credit line should be included and a permission letter supplied by theauthor. All manuscripts are peer reviewed. Allmaterial accepted for publication is subject to copyediting. Authors receiveproofs of their articles before publication and should answer all queries.Corrections to proofs must be restricted to printer’s errors; no rewritingcan be allowed. Reprints may be purchased using the reprint order formthat is sent with the proofs. 1. Declaration of Helsinki. Bull Pan AmHealth Organ 1990; 24:606–9. 2. Uniform requirements for manuscriptssubmitted to biomedical journals. International Committee of Medical JournalEditors. Ann Intern Med 1997; 126:36–47. The information that follows will helpyou to prepare a manuscript for electronic submission to the Web-basedpeer review system used by Medical Paradigm. Please note that the guidelinesgiven here contain information pertaining to online manuscript submissiononly. We strongly encourage authors to submit manuscripts online at (**webaddress**). Authors who are unable to submit online may send hardcopysubmissions. Contact the Medical Paradigm Editorial office. Submit manuscripts to (**insert web address**).You will be able to monitor the progress of your manuscript through thepeer review process. Use the Get Help Now link at the login screen to contactManuscript Central if you encounter problems while submitting a manuscriptelectronically. To facilitate the review process, manuscriptsmust be saved in Microsoft Word format (.doc) or rich text format (.rtf).This requirement applies to the PC and Macintosh platforms alike. If youare using any other word processing program, you must save the file inrich text format. Double-space all text. Allow adequatemargins. Do not right-justify the text. Use basic fonts such as Arial, Courier,Helvetica, Times, or Times New Roman in a size no smaller than 12 points.Special or mathematical characters and Greek letters not available on astandard keyboard must be entered using the Symbol font. For the review process, illustrations—whetherembedded in the document or submitted individually—may be of a smallersize and may use formats other than those required for final acceptance.Acceptable formats are JPEG, GIF, or TIFF, with at least 1000 pixels inthe greatest dimension for images and at least 2500 pixels in the greatestdimension for line art. If you are scanning your illustrations,use a flatbed scanner set to 300 dpi for images and 1000 dpi for line art.The original should be at least 3 inches and no more than 7 inches in thegreatest dimension. If necessary, convert the graphic to TIFF using a graphicmanagement utility (for example, Adobe Photoshop, Adobe Photoshop Elements,Jasc Paint Shop Pro). Use simple file-naming conventions forall illustrations. 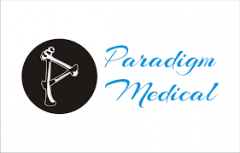 Log on to Medical Paradigm ManuscriptCentral at (**web address**). Once there, you can either createan account or enter an existing account. If you believe that you already have anaccount, click Check For Existing Account, and enter your e-mail address.If your address is found in the account records, you will receive at theaddress you just entered an e-mail message containing the associated logininformation. If you do not have an account on the system,click Create A New Account. Complete all the form fields accurately. Fieldsshown in boldface must be completed. If a required field does not applyto you, type “none” or “N/A” in the space provided. When you are finishedentering information, click Submit Information to create your account. After you have logged in to your account,navigate to the Corresponding Author Center, and click Submit First DraftOf A New Manuscript. As you progress through the submission process, theinformation in the Manuscript Data Summary box is appropriately updatedupon completion of each page. If for any reason you exit the system beforecompleting the submission process, you can continue where you left offby logging in, navigating to the Corresponding Author Center, clickingPartially Submitted Manuscripts, and following the resulting instructions. Screen 1 — Manuscript Details: Select a manuscripttype from the pull-down menu. Type your summary statement and the pagenumber from the text where this sentence appears. (Alternatively, you cancopy the statement from your manuscript text file and paste it here.) Inthe boxes provided, indicate the total number of tables and figure components,and note whether any figures are in color. Click Save And Continue whenyou have completed this screen. Screen 3 — Authors: Enter the names (up to10) of the authors of the manuscript. Indicate the corresponding authorand primary, secondary, or tertiary affiliation. Click Save And Continuewhen you have completed this screen. (Or click Previous to return to theprevious screen.) Once a manuscript has been received by Medical Paradigm,any changes in authorship will require the submission of additional information. Screen 5 — Abstract: You can either copy yourabstract from your manuscript text file and paste it here, or type theabstract directly into the box. Use the Character Palette for special characterssuch as Greek letters and mathematical symbols, or for special formatssuch as italic, bold, and superscript characters. Proofread your abstractcarefully. (You can also check your abstract on the next screen by clickingView Abstract.) Click Save And Continue when you have completed this screen. (Or click Previous to return to the previous screen.) If you are submittinga manuscript that does not require an Abstract, please type “N/A” in theAbstract box. Screen 6 — Keywords. Click Keywords and followthe resulting instructions. Click Save And Continue when you have completedthis screen. (Or click Previous to return to the previous screen.) Pleasenote that keywords are mandatory (except for letters to the editor, editorials).If you fail to provide keywords (either typed or from the drop-down list),your manuscript cannot be processed. If you have a question about whetheryour submission requires keywords, please contact the Medical ParadigmEditorial Office at [email protected]. Screen 9 — File Upload Center: Click Use FileManager to begin uploading the files containing your text, tables, figures,and supporting materials. 1. Browse to the desired file. Note that for an original submission,images should be uploaded as part of the main document. The other categories(color image, grayscale image, etc.) are used at the revision stage. Pleaseremember to separately upload the full title page; include an abbreviatedtitle page with the text. 3. Files uploaded under the designations“main document,” “main body,” “color image,” grayscale image, line art(color), line art (black and white), and multimedia are destined for thereviewers. Please ensure that those files contain nothing that might revealyour identity. 4. Click Upload. An upload confirmationwindow opens, asking you to enter a description of the document or illustration.Please do not use your name or any identifying information in the description. Screen 11 — Submit for Review: Click ViewYour Proof As It Will Be Seen By Reviewers to verify that all files forreview are present in the Reviewer’s Proof window. When you are satisfiedthat all files are available, click Submit Your Manuscript. Confirmationof your submission appears. Print or save the manuscript ID number. Includethat number with any form that you send to the editorial office by faxor postal mail. Immediately after you submit a new manuscriptelectronically, send the Author Contribution form and the Transfer of Copyrightand Certifications Agreement form to the Medical Paradigm editorial officeby facsimile to +1-609-652-2306 (United States) or +31-71-515-0748 (Netherlands).Copies of those forms can be found under Instructions and Forms at (**webaddress**). simply prepare a file containing the necessaryinformation and listing the author contributions, and upload it through(**webaddress**). However, the Transfer of Copyright and Certifications Agreementform must be faxed. You can return to the Corresponding AuthorCenter at any time to check the status of your manuscript. “Awaiting Preliminary/FinalDecision” means that your manuscript is currently being reviewed by thereviewers or the Editor. Contact the Medical Paradigm editorialoffice if you are able to submit your revised manuscript only in hard copy.When you prepare a revised version of a manuscript, you must carefullyfollow the instructions given in the Editor’s letter regarding preparationof the same—in particular, preparation of the annotated copy. Failure tofollow instructions may result in a delayed review of the revision or inreturn of the revision to you, without review, for proper preparation. Revisions received more than three monthsafter the initial request may be sent for another review cycle at the Editor’sdiscretion. If a revision is not received within six months of the request,your file may be closed. Refer to the information that follows and to theonline Revision Checklist form (found at the Instructions and Forms page)for submission of revised manuscripts. Text file — Because you cannot access theoriginal manuscript once it has been submitted, prepare a “clean” versionof the manuscript from your saved copy of the original submission. Submitthe revision in Microsoft Word format (.doc) or rich text format (.rtf).If you are using any other word processing program, you must save the filein rich text format. Do not embed illustrations. Use the default settingsof your word processing program. Keep the text file as free from formattingcodes as possible: Do not use italic or boldface formats, underlining,unusual fonts, codes for centering, or extra line spacing. Especially avoidright-justified margins. Double-space all text. Use tabs to indent thebeginnings of paragraphs, and insert only one space after terminal punctuationmarks. Use hard returns only at the ends of paragraphs or between manuscriptsections; do not insert hard returns in the middle of paragraphs. Do notinsert tabs in references; use only one hard return at the end of eachreference. Use basic fonts such as Arial, Courier, Helvetica, Times, orTimes New Roman in a size no smaller than 12 points. Special or mathematicalcharacters and Greek letters not available on a standard keyboard mustbe entered using the Symbol font. Electronic illustrations — Prepare any revisedillustrations that have been requested. Re-upload all illustrations, eventhose that were not revised. For images, use the TIFF format or Photoshopformat (PSD) with at least 1500 pixels in the greatest dimension. Monochromeimages should be saved in grayscale mode; color images should use CYMK.For line art, use the TIFF format or Photoshop format (PSD) with at least5000 pixels in the greatest dimension. Files containing black-and-whiteart should be saved in bitmap mode. When submitting PSD files, positionlabels on layers; do not merge the layers. If you are scanning illustrations,use on a flatbed scanner set at 300 dpi for images or 1000 dpi for lineart. The original should be at least 3 inches and no more that 7 inchesin the greatest dimension. If necessary, convert the scanned output toTIFF using a graphics management utility (for example, Adobe Photoshop,Adobe Photoshop Elements, Jasc Paint Shop Pro). Submit your revision at(**webaddress**). Enter the Author Center, and click the title of the paperbeing revised. The Draft Center then opens. At the Draft Center, your manuscriptis identified by manuscript number. Submit your revision, following thesame steps that you used to submit the original version. Click View CommentsAnd Respond to address the reviewers’ points. Enter your comments to theEditor in the Response To Editor box, and enter your detailed responsesto each of the reviewers’ points, as circled by the Editor, in the ResponseTo Reviewers box. Copyediting — After final acceptance and beforepublication, your manuscript will be copyedited to conform to Medical Paradigmstyle and usage. The copyediting may be substantial. The correspondingauthor is responsible to read the copyedited manuscript in proof and toanswer all queries in full.